Superbly family friendly, this collection of small waterfalls enhances a shady hiking trail with fun bridges and metal walkways skirting the creek. Delightful year-round! Sweet Creek Falls Trail Complex is located near Mapleton on Hwy 126 inland of the Oregon Coast. Four tiered-plunges ranging from 10 to 30 feet (3.0480 - 9.1440 m) cascade for a total of 70 feet (21.336 m) creating a multiple waterfall effect. Many other smaller falls grace the hike in. Sweet Creek Falls is the grand finale. 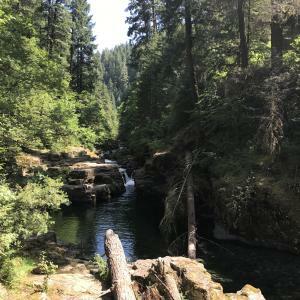 This easy, family-friendly 2.2 mile (3.5406 km) hike (Sweet Creek Trail #1319) involves wooden bridges, damp dirt trails and small rivulet jumping. If you like to get your feet wet, wade in the small pools along the way. Please be cautious of slippery mossy rocks and fast moving currents. There are four trailheads. For the full hike, start at the Homestead Trailhead - the first one you see. Next is Sweet Creek Falls Trailhead, Wagon Road Trailhead and Beaver Creek Falls Trailhead. Each subsequent trailhead offers a shorter hike. There is a section of canyon wall "cat-walk" that is not popular with some dogs. Directions: At Siuslaw Bridge in Mapleton, leave Hwy 126 and drive south on Sweet Creek Rd for 11 miles (17.703 km). Sweet Creek Falls comprises four distinct waterfall tiers cascading a total of 70 ft (21,3 m), with the plunges ranging from 10 - 30 ft (3 - 9,1 m). The lush Sweet Creek Falls Trail Complex features 11 small waterfalls in all. Sweet Creek Trail #1319 has four segments totaling 2.9 miles (4,7 km), with four separate trailheads and parking lots. Homestead Trailhead is the most direct route at 1.1 miles (1,8 km). 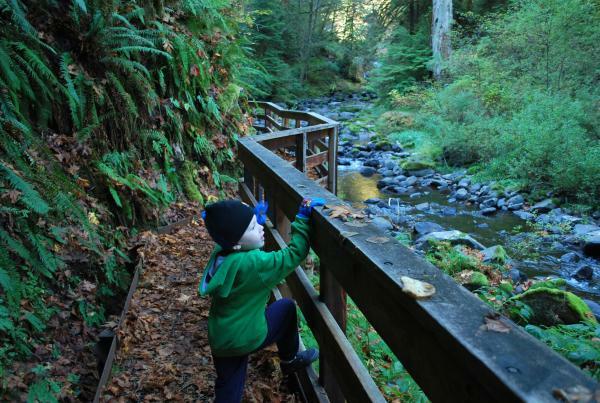 This hike is easy, family-friendly and year-round. 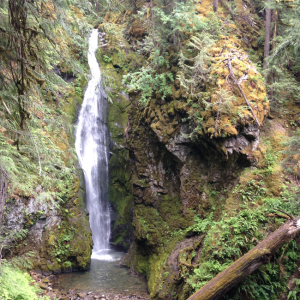 Sweet Creek Falls is part of the Siuslaw River watershed in the Siuslaw National Forest. Float the mostly languid Siuslaw River and watch for birds and wildlife along the banks. Historic Old Town Florence is the perfect place for dinner and an overnight. Amble the wooden docks overlooking the Siuslaw River. Adjacent to the Oregon Dunes National Recreation Area is camping, canoeing, sandboarding, dune buggy tours, horseback riding and golf. Drive the scenic byway, Highway 101 to see the Heceta Head Lighthouse and the Sea Lion Caves.